While the M1 Abrams was outgunned when it first entered production, since the M1A1 entered service in 1985 it has become one of the most lethal tanks in the world with its 120mm gun. Has it kept up? In the 1970s, the situation for NATO tank forces in Europe was grim. The program to develop the next generation battle tank for both Germany and the United States, the MBT-70, was about to crumble and fail, and the next generation of Soviet tanks was about to reach the front lines. The tank forces of the U.S. and its allies were reliant on the aging M60 tank or roughly comparable analogues. Declassified CIA documents from the period shared a pessimistic estimate of the balance of forces: the Soviet tanks were more numerous and technically superior. Following the failure of the MBT-70, Congress forced the Army to begin a new tank program under strict cost and time limitations. A developmental concept paper (DCP) for this new tank was created in 1972 and approved in 1973. The DCP called for competitive evaluations, trialing of turbine versus diesel engines and concurrent operational and engineering trials. The armor and armament of the new tank, now dubbed the XM1, aimed to incorporate the latest developments in armor technology. The Army specified that the British-developed Chobham armor be incorporated into the design. The next-generation British 110mm tank gun and German 120mm tank gun were also considered for incorporation on the XM1. However, the German gun was found to have some difficulties in development when the XM1 program was about to finish. As a result, the XM1 had provision to mount the 120mm in its trunnion design but mounted the 105mm M68A1 that armed the M60 Patton. The XM1 entered serial production as the M1 Abrams in February 1981. It was equipped with a turbine engine, Chobham composite armor, and the M68A1 105mm gun. By all accounts, it was an excellent tank in mobility and protection. But was it undergunned with the 105mm versus its potential adversaries in the East? The M68A1 on the M1 Abrams could fire a variety of armor-piercing fin-stabilized discarding sabot (APFSDS) rounds. The best anti-tank round when the M1 entered service was the M774 APFSDS round, but the earlier M735 round was more common in stockpiles, though the number of M774s increased rapidly in the 1980s. It was nominally replaced by the M833 in 1983, but the advanced rounds only filtered down to units by 1985. The M735 round is made of tungsten; the M774 and M833 are made of depleted uranium. 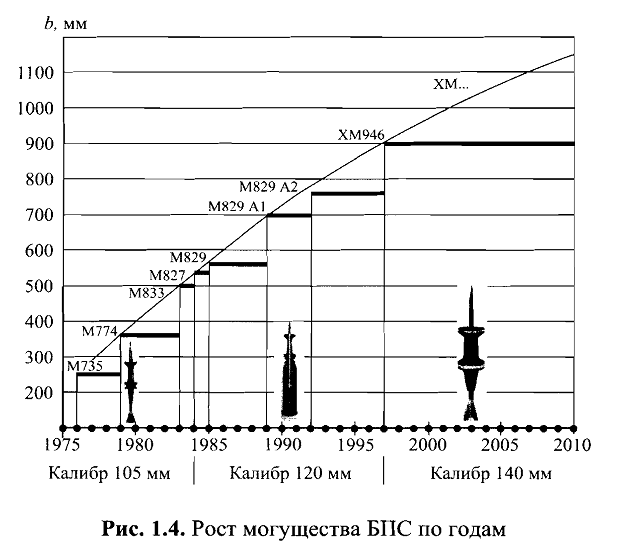 Russian sources peg the penetration of the M735, M774, and M833 at ~250mm, ~375mm, and ~500mm RHAe, respectively. American sources are slightly more optimistic, with the M774 estimated to penetrate in excess of 400mm RHAe and the M833 in excess of 500mm. This would allow the M774 possibly defeat the T-62, basic T-72, and T-64A from the frontal aspect. The M833 is more comfortable, possessing significant overmatch versus the basic T-72 and T-64A. But the most common round, the M735, does not fare well. The CIA estimated that the M735 had a 20% probability of kill versus the basic T-72 frontally, compared to the 50-70% probability of kill of the M774. But by the time the M1 Abrams entered service, it was facing the latest generation of Soviet tanks: the T-64B, T-72A, and T-80. These were much tougher nuts to crack than the basic T-72 and T-64; they featured composite armor of their own. M833 was estimated to be able to penetrate some of these tanks, but it was far from certain (the CIA document estimated that the T-80 would still be at an advantage versus the XM1 armed with M833). The T-72B, which entered service in 1984 only made matters worse for the basic M1 Abrams, boasting even heavier armor than the T-72A. Thankfully, the Army already was looking ahead. In March 1981 when the first basic M1s were rolling off the production line, the Army procured its first prototype M1E1s. The M1E1 featured a simplified version of the German 120mm gun, now designated M256. It also had improved armor; nuclear, biological, and chemical protection system; and an improved powertrain versus the basic Abrams. The M1E1 was accepted into service as the M1A1 in 1984, and the first serial M1A1s rolled off the production line in December 1985. The basic M1 Abrams ended its production run earlier that year. With the new 120mm gun, the Abrams finally had a gun that could comfortably penetrate most of its adversaries when armed with the new M829 APFSDS round, estimated to penetrate around 540-550mm RHAe. This was replaced by the M829A1 round in 1988 which was rated at 700mm RHAe, showing that the 120mm caliber had significant room for improvement. The M829A1 was proven in combat during the Operation Desert Storm, defeating Iraqi T-55s and T-72Ms with ease. Despite its increased penetration and combat success against Iraqi tanks, the M829A1 was estimated to be unable to defeat its Soviet contemporaries, the T-80U and T-72B Obr. 1989, which were fitted with Kontakt-5 second-generation heavy explosive reactive armor (ERA), which could decrease the penetration capability of APFSDS rounds. As a result, the Army developed the M829A2 and M829A3 rounds, which featured increased-length penetrators and special tips to defeat the heavy ERA threat. The M829A3 round is the current wide-issue for M1A1 and M1A2 Abrams crews and likely can defeat the armor of most tanks in the world today, including early T-72B3s and T-90As which still use Kontakt-5 ERA. But in 2018, the next generation of tanks is rolling out. The new T-90M and T-80BVM all use improved Relikt ERA which is even more effective against APFSDS projectiles. The T-14 Armata’s armor and active protection system package are supposedly even more effective than Relikt. The American answer to this is the new M829A4. The new projectile is said to be able to defeat this new generation of heavy ERA, but the exact mechanism is uncertain. It is known that the M829A4 has an ammunition datalink on the base of the projectile allowing the sensors and gunner to program the round in a certain way, making it a “smart” round of sorts. While the M1 Abrams was outgunned when it first entered production, since the M1A1 entered service in 1985 it has become one of the most lethal tanks in the world with its 120mm gun. It remains to be seen whether this will continue into the future, or whether American tanks may have to be upgunned again to meet future threats. Information about the Abrams’s development taken from M1 Abrams Main Battle Tank 1982-1992 by Steve Zaloga and Peter Sarson and M1 Abrams in action by Jim Mesko.